An 18-wheeler truck is a formidable vehicle. Designed to transport large amounts of freight, the 18-wheeler takes special skills to maneuver. It also demands a certain amount of caution from nearby passenger vehicles. 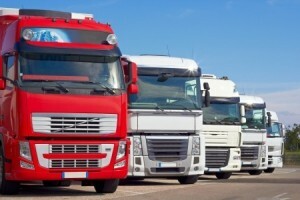 Drivers of cars, motorcycles and scooters are often unaware of the challenges inherent in truck driving, and they do not always give them the respect and space that they require. Treating 18-wheelers like normal passenger vehicles can have grave consequences. Size is an obvious difference between a car and an 18-wheeler. The former has just four wheels; the latter has more than four times that. The tanks holding the freight are long and inflexible, requiring extra space when turning corners. In fact, the turning radius for a large truck is around 55 feet, compared to an average road width of 24 feet and a turning radius of around 35 feet for a typical car. Given that a fully loaded trailer can weigh up to 80,000 pounds, its momentum significantly extends the time needed to come to a full stop on any surface other than an upward slope. The length of time required for an 18-wheeler to stop is 40 percent greater than it is for cars. Stay out of trucks’ blind spots. Some car drivers cruise along right next to a truck for long periods of time. Truck drivers cannot see vehicles that are driving right next to the truck’s midsection. Drivers trying to pass a truck should do so as quickly as possible without exceeding the speed limit. Avoid cutting sharply in front of trucks. A fully loaded truck can weigh more than ten times the weight of an average-size car. If a driver cuts in front of a truck and traffic slows suddenly, the truck driver might not be able to respond in time to the car’s sudden presence. Be patient while trucks reverse. Backing up a truck takes a lot of finesse, and visibility is severely limited. Allow trucks plenty of room to turn. On a two-lane road, a truck will need to move to the lane’s far left in order to turn properly. When a truck is on a four-lane road, it is not uncommon for the driver to turn from the left lane. Drivers need to be aware of the time and space required for truck drivers to maneuver their vehicles and respond to sudden traffic changes. By engaging in careful and respectful driving habits in the presence of an 18-wheeler, drivers can keep nasty roadway accidents to a minimum.